In Mexico, López Obrador takes office, vows to "end corruption and impunity"
AMLO, as he is known, pledged an orderly transition but one that is "deep and radical" to be able to tackle the corruption in the country. 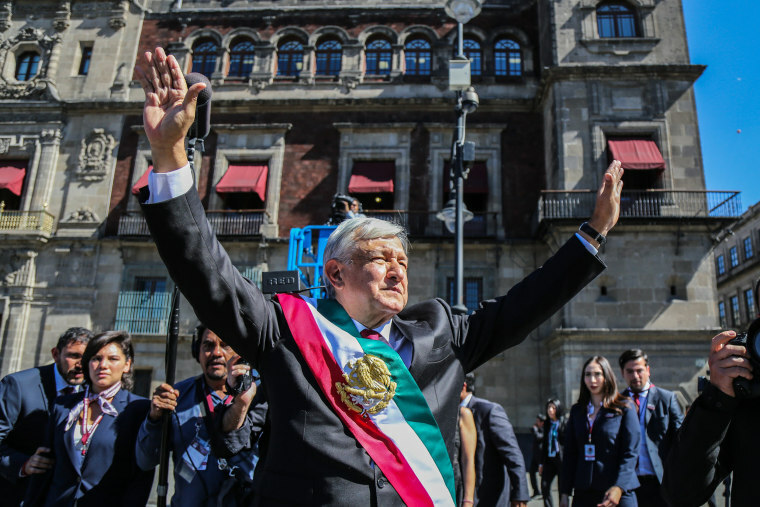 MEXICO CITY — Andrés Manuel López Obrador took the reins of governance here on Saturday, becoming the most left-wing president Mexico has had in its modern history — and assuming office at a time of growing frustration among Mexicans and high expectations for change. Tired of the rampant corruption that plagues all levels of government, as well as sky-high violence, Mexicans voted overwhelmingly for AMLO, as López Obrador is known, giving him a landslide victory. Some have even compared López Obrador to Donald Trump for insisting on putting national concerns first. Mexico is Latin America’s second-largest economy and a major trading partner of the U.S. Many Mexicans have high expectations for López Obrador, who is limited to one six-year term, with no shot at re-election. A recent poll by the newspaper El Financiero indicated he has a 66 percent approval rating, while outgoing President Enrique Peña Nieto has only 26 percent. “His supporters are looking for him to be the president of a new era in Mexico," said Jason Marczak, director of the Adrienne Arsht Latin America Center. "He will also face the challenge of having to deliver quick wind for supporters who are incredibly anxious and eager of what his presidency might be." Many crimes committed go unpunished in Mexico, where the murder rate is at a record high. Corruption and crime are not new, but AMLO capitalized on it as a left-leaning populist, campaigning on curbing violence by tackling poverty and inequality, which he vowed to uphold in his speech on Saturday. In Mexico, even those who did not vote for him are expressing hope that he will bring positive change. Graciela Romero, a business owner in a middle-class Mexico City neighborhood, is a supporter of the center-right PAN party. Her top issue is the economy, and she's upset that she has had to increase the price of the fruits and vegetables she sells to counter rising fuel prices. “We are a rich country, yet we pay so much for gasoline,” she said. López Obrador plans to revive Mexico’s oil industry by building a new refinery. Nearly all of Mexico’s massive fuel imports come from the U.S. The refinery is also part of his agenda to focus on projects in the county’s more impoverished and underdeveloped region in the southeast, including his home state of Tabasco. Jesús Hernández Tolentino, 48, a taxi driver from Mexico City, rents the car he uses for work at $15 a day. After paying for gas, his daily income is around $11. He said the price of gasoline was going up under the government of Peña Nieto. “López Obrador has mentioned he is going to build a refinery and that the price of gasoline is going to decrease, and that is what we are hoping for,” Tolentino said. He has supported López Obrador’s political party since it was founded in 2014 and voted for him in all three elections he ran in. Nervous investors have watched López Obrador’s transition period closely. Weeks before taking office, markets were rattled by announcements that the incoming administration would cancel a partially built $13 billion airport and impose limits on bank commissions. AMLO tried to assuage those worries in his inaugural address. But he made clear his agenda trying to narrow the nation's inequality. The rise of López Obrador comes at a time when Latin America has been moving towards right-wing leaders. López Obrador campaigned for over 15 years as a leftist, defending the poor and was elected under his own political party. Traditionally Mexican politics were dominated by three parties: the centrist PRI, the conservative PAN, and the leftist PRD. But it was the MORENA party that won Lopez Obrador a landslide victory. His MORENA party also won a majority in Congress, allowing him more freedom to change policy. Can Mexico's new president change the course of strained U.S.-Mexico relations? A key move to help combat corruption would be to have an independent attorney general, said Olson. “That proposal has been on the table for a long time. But it’s not clear yet whether he will accept that the attorney general will be independent of the president,” he said. A new NAFTA deal signed on Friday at the G20 meeting — called United States-Mexico-Canada (USMCA) — cleared a major obstacle for López Obrador, allowing him to focus on his domestic agenda. López Obrador had been a critic of the 1994 NAFTA, saying it had not done enough to improve the lives of Mexican workers. But recognizing the importance of economic and financial-market stability, he praised the renegotiated USMCA deal. The first foreign dignitaries that Lopez Obrador greeted as he took office were U.S. Vice President Mike Pence and Ivanka Trump. How López Obrador handles relations with Trump, who has sparred with Mexico over calls for a border wall, will be closely watched. The recent migrant caravan, that has resulted in over 5,000 Central Americans camped out in a sports complex in Tijuana, recently presented López Obrador with a difficult task — appease Trump while upholding his position of defending the poor. AMLO signaled on Tuesday he would be willing to house the migrants on Mexican soil while they apply for asylum in the U.S. — something Trump has demanded. He also called on Trump to contribute to development projects to help create jobs in Central America to help stem the flow of migrants. If Central American migrants continue to make their way to Mexico in large numbers for years to come, it could erupt into a political crisis for López Obrador. But for the majority of Mexicans, Central American migrants are not top of mind. Vanessa Calderón, 22, a third-year medical school student, has already decided she does not want to have children as she weighs what she sees around her and what she thinks is coming. “There is going to be more insecurity, more unemployment, and I think more violence and intolerance,” said Calderón. She did not vote for López Obrador, though most of her family did. Yet, she is still hopeful.